Experience a full day of adventure in a luxurious Pink Adventure Tour Trekker vehicle that will pick you up from your Las Vegas hotel. As the only company to offer tours of both destinations in one day, our Certified Interpretive Guides are both trained drivers and entertaining local experts. Begin your day by traveling in comfort through the Mojave Desert en route to the Grand Canyon. Your guide knows all about the desert’s unique ecosystem and will point out noteworthy wildlife and plants along the way. Keep your eyes peeled for Joshua Trees, which only grow in this part of the world. Your first West Rim stop will immerse you in Hualapai culture at Eagle Point. You'll see traditional dwellings and may experience unique dances and storytelling performed by community members. Next up is the Grand Canyon Skywalk. For an additional fee, you can walk on a glass platform that extends 70 feet past the rock rim and 4,000 feet above the canyon floor. You’ll never forget the spectacular views of the Colorado River and Grand Canyon. Get your picture taken by the attraction’s designated photographer—and look down if you dare. At Guano Point, be sure to ask your guide about the bizarre mining history of the cave below the overlook. Remnants of the old miner’s cable tramway are still at the site today, half a century after it was abandoned. Practice using your panoramic camera function before you arrive, because this is one of the most amazing views you’ll ever see. To ensure you capture memories of this remarkable place, your guide can help you get the perfect shot. Before leaving the Grand Canyon, you’ll stop at a trading post that features gifts, handcrafted souvenirs and sundries. Then, it’s on to the day’s second destination: the Hoover Dam. Next, experience the immensity of the Hoover Dam from the observation deck while looking down at Lake Mead, the largest reservoir in the country. Take plenty of pictures to ensure you capture the incredible adventure and marvels of the Grand Canyon and Hoover Dam. A short walk on the 900-feet-tall Michael O’Callaghan—Pat Tillman Bridge provides a bird’s-eye view of the Dam; this is a view of the mighty dam as it holds back Lake Mead. 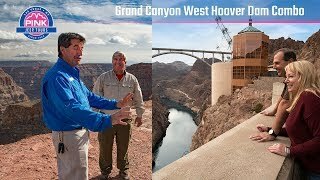 A drive through historic Boulder City includes a stop at the Boulder Dam Museum inside the Boulder Dam Hotel gives a further look at the Hoover Dam story. To round out the day, hop back aboard the comfortable Tour Trekker and relax on the ride back to your hotel. To make your exclusive tour experience even better, we have all the details covered, including a boxed lunch, bottled water and parking and admissions fees. It was very enjoyable and well worth the time and money. Lunch was very good. Overall, a great experience! UNCOMFORTABLE TO GO IN AND OUT AND YOU CAN'T TO SEE AHEAD. The locations speak for themselves, The differentiator in our tour was having a guide knowledgable and entertaining for the hours of driving we had. Really nice!! John, our tour guide was very informative, professional, helpful and entertaining. The best part of my first trip to Vegas.